I didn’t grow up around here, so when I first heard that a 125-foot-long, covered wooden ramp was once used to launch young tobogganers across an icy lake, I was skeptical. Would the city really sanction such a structure? Would parents really let their kids rocket down it? Was it something permanent – perhaps a remnant of a 19th-century log flume – or was it installed each winter for the amusement of Chippewa Valley youngsters? It took a bit of digging (thank you, Internet!) to get some answers. As it turns out, the toboggan chute was real. Last winter, I posted a question about the toboggan slide to the 14,500-member You Know You Are From Eau Claire When ... Facebook group, figuring some nostalgic Eau Clairians would remember it. The group didn’t disappoint. One woman recalled frequenting the lake to skate and sled in the late 1950s and early ’60s. (It didn’t hurt, she noted, that the workers were good-looking college kids.) She and her friends would check out toboggans – if you were lucky, you could use them for 30 minutes – and would compete to see who could travel the farthest across the frozen lake. The slide was an annual fixture at Half Moon Beach, on the lake’s northeast shore, between the 1950s (or possibly earlier) and the 1980s. The wooden chute was about 125 feet long and was under the supervision of a couple of adults. According to a 1969 item in the Daily Telegram newspaper, the city Parks and Recreation Department operated the slide. There was a warming house as well as a limited number of toboggans to borrow, although sledders were encouraged to bring their own toboggans. Kids age 12 and younger had to be accompanied by an adult or a teenager to use the big slide. For many years, a skating rink was also maintained on the frozen surface of the lake, which surrounds Carson Park in the center of Eau Claire. When it opened in December 1960, for example, it was used by an average of 600 skaters a day, the Daily Telegram reported. The sledding and skating added to longstanding Eau Claire winter sports such as ski jumping (which dates to 1887 in Eau Claire) and curling (which goes even further back, to 1876). The Chippewa Valley Museum helpfully provided two pictures from its vast collection that show the toboggan chute: One from the 1950s and the other from the ’60s. They corroborated the image I had in my mind from what I’d read: bundled children, grinning with anticipation, zooming off a rickety-looking wooden structure onto the ice. The accident apparently helped bring an end to the toboggan chute. It was only open for a short time the following winter because the city’s insurance company canceled coverage for the slide as of January 1986. “That was really the deciding factor,” Van Es said in a recent interview. “It was a serious injury, and with that knowledge we couldn’t continue to operate it knowing kids could continue to do that.” While Van Es maintains that the chute was comparatively safe when it was supervised – unlike traditional sledding hills, where kids might be sliding willy-nilly all at once, the toboggans went down the chute one at a time – it nonetheless posed a danger if kids sneaked in after hours. 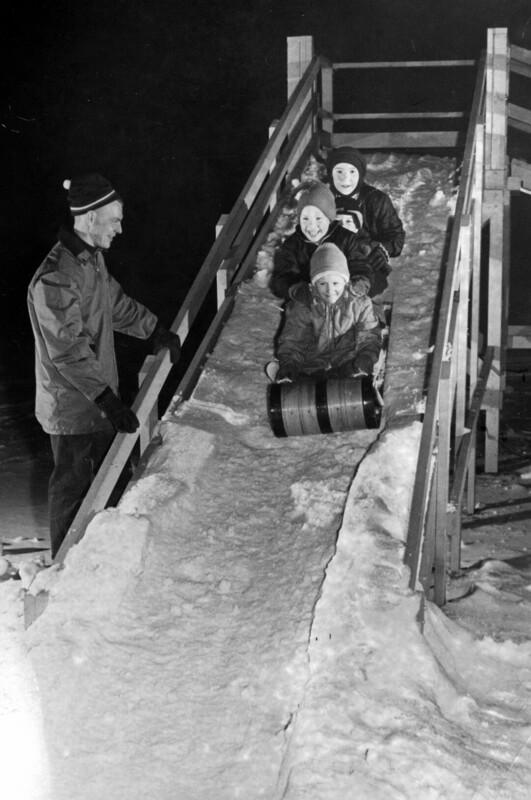 Like other local recreational fixtures of the era – such as Carson Park’s beloved rocket slide or the old, repainted tractors that used to be placed on playgrounds – the toboggan chute made way for safer, more liability insurance-friendly equipment. 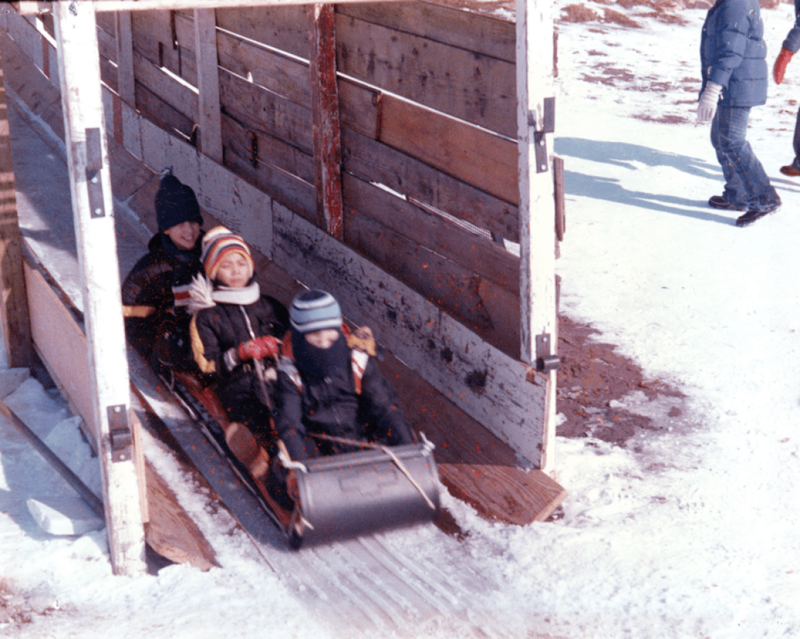 In late 1987 the City Council voted to close the toboggan chute for good as part of a series of budget cuts. Today, toboggans are a rare sight, and if you want to ride one, you’ll just have to do it the really old-fashioned way – right down the hill, no chute required.